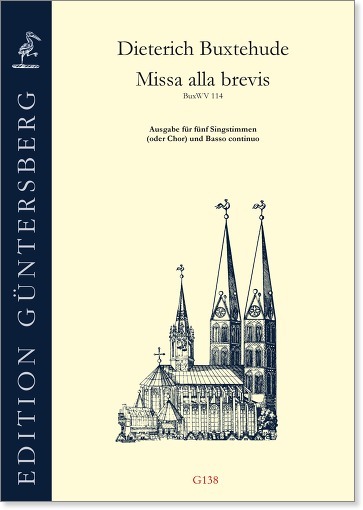 A closer look at Buxtehude’s Mass, which consists of Kyrie and Gloria only, reveals a more instrumental than vocal concept. This speaks in favour of an instrumental setting – e. g. by a viol consort – as an advantageous and rewarding alternative to the setting by five singing voices or choir. Another variant scoring entirely usual at that time would have involved colla-parte doubling by several instruments, with each of the voice parts then possibly sung be multiple voices. 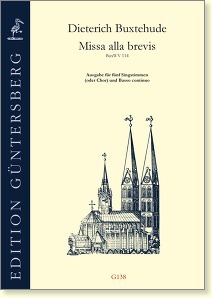 Our editions allow for all above mentioned setting variants with or without basso continuo.